Too Young for a Hair Transplant? It’s often frustrating to be young and also be losing your hair. It can be a particularly difficult time to deal with the self-confidence issues and the psychological effects of hair loss when you’re in your 20s or 30s. Some patients even begin to lose their hair when they’re in their teens. At RHRLI, we have patients from all walks of life and we always consult our patients before we begin treatment. We offer a permanent solution to hair loss or thinning hair. It’s called the ARTAS® System and it uses robotic technology to transplant hair with precision. We are often asked questions about whether certain patients might be too young and what age is appropriate for treatment using the ARTAS® System. So we want to give you information on hair transplants for younger patients. There’s no universal age that’s considered too young for a hair transplant. That’s because each case is different. But there often are guidelines. One strong recommendation from the International Society of Hair Restoration Surgery (ISHRS) involves dealing with minors. If a patient is a minor, an ethical physician must insist that the patient’s parent or legal guardian be involved in the decision-making process. It must be the parent or guardian who resolves any legal issues that might arise in connection with the decision. But what about patients who are over 18 or in their early 20s? That’s more of a gray area and many hair transplant surgeons are wary about doing a procedure involving a patient 25 or under. Writing in HuffPost, Dr. Edward Maitland Ball, Founder and Clinical Director of the Maitland Clinic insists that as much as patients have difficulty dealing with hair loss at a young age, there are issues with doing surgery for 25 or under patients. “The problem with having surgery under the age of 25 is that hair loss is a progressive condition and the supply of donor hair we have to use in hair transplant surgery is of a very limited supply,” Maitland said. Patients in their late teens or early 20s often ask surgeons to give them low strong straight hairline, but according to Maitland that will start to look unnatural if you continue to lose hair behind the transplanted hairline. ISHRS warns that the pattern of your hair loss may not be revealed at an early age and it’s difficult to design a new hairline that will look natural for a young patient’s entire life. 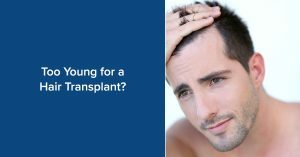 Because of this, you might have to have more transplant surgeries later in life if you do opt for a hair transplant at a younger age. At RHRLI we can help patients who’ve had hair transplants too early in life and we can correct any unfortunate results of that earlier surgery. We will be happy to consult with all of our patients to see if they’re ready for hair transplant surgery. We’re the only hair treatment center on Long Island that has the ARTAS® System. To learn more about the ARTAS® System or to schedule a consultation, contact us today.